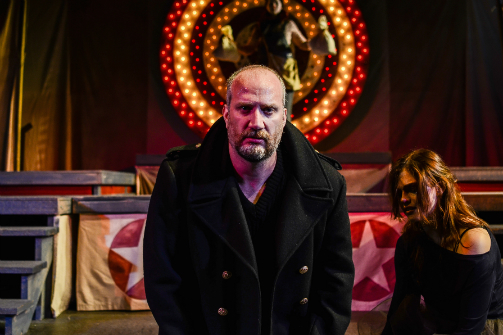 Brendan Averett, Kate Lydic, and Kerry Kastin in Titus Andronicus. Photo by Kalle Westerling. BOTTOM LINE: A beautifully gruesome production of a lesser known tale of revenge by Shakespeare. I feel sick to my stomach in a good way. Is that possible? I need a barf bag, yet I relish the thought of seeing this production of Titus Andronicus once again. Perhaps the theatre could put airplane sickness bags on each seat for those with a sensitive stomach. I knew what I was getting myself into having been familiar with the work, but it still made my insides churn. Let me be clear. All of these descriptions are in a positive light. The New York Shakespeare Exchange blows it out of the water with this production. Titus Andronicus (Brendan Averett) is an esteemed general who is loved by the people of Rome. Once the Emperor is dead and Titus returns from war he chooses not to accept the movement to make him their leader. Instead the late Emperor's older son Saturninus (Vince Gatton) takes the throne. Titus has many sons, but only one daughter: Lavinia (Kate Lydic). Seeing as how Saturnius's younger brother Bassianus (Adam Kezele) is engaged to her, Saturnius chooses a war captive, Tamora (Gretchen Egolf) Queen of the Goths, to be his wife. Unfortunately plots against the Andronicai family develop because Titus killed one of Tamora's son's as a sacrifice. Now that she has a position of power, she wishes to seek her revenge upon him and those he loves. Nudged along by her love Aaron (Warren Jackson), Tamora's sons Demetrius (Nathaniel P. Claridad) and Chiron (Ethan Itzkow) show their evil nature as they do unspeakable acts to Lavinia. Is there a winner in this battle? Or do we all lose when grief and death are involved? It may or may not be difficult for you to imagine a show that is both extremely fun and pathetically disgusting. That comes from the strong cast in combination with a skilled production team. This show knows what it is and what it needs to accomplish. Due to the consistent commitment to intention, despite being a Shakespearen play, I found the plot easier to follow than other shows not written in iambic pentameter and having words spoken with strange amounts of syllables. These actors demonstrate their craft well so there is nothing intimidating about the language. With double entendres galore and raw emotion already present in the language, this team brings the incredible words to life. Strong performances, stunning costumes, and the unique construct of creating this world within a circus/carnival tent add together to show the audience something new. They even have a clown (Kerry Kastin) participating and watching each scene throughout the show as she takes on each minor character who is ultimately killed. Sick, but oddly satisfying! A few logistical aspects do come into play when choosing to see this run of the show though. It is quite a long night (8:30pm until 11pm). That is on top of the fact that the entire work tugged on my emotions and left me mentally drained. Also, if you are a bit shy, be aware that a few of the actors do utilize the center aisle to sit and observe the events occurring onstage. It is an interesting construct, but might be awkward for those sitting right around that location. That being said, Titus Andronicus has been my favorite work of Shakespeare for years after dissecting the text in college. This was my first time seeing a live production of it and it did not disappoint in the least.